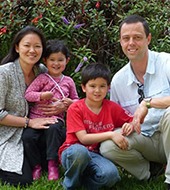 We are the McAlhaneys and we live and serve in Kijabe, Kenya along with our two children – Luke and Kate. I (Tim) am an ordained minister, have a PhD in Church History/Theology, and have over a decade of teaching experience. I serve as the Spiritual Life Director at Moffat Bible College where I teach core Bible and theology courses, oversee student organizations, schedule chapel events, and facilitate student outreaches. I am also the faculty patron of Antioch Mission Fellowship where students focus on missions, building leadership skills, and training missions-minded pastors. Through God’s guidance, I seek to invest in the lives of these future church leaders, missionaries, and pastors through teaching and mentoring. I (Maureen) am a physician trained as a general surgeon, and currently working with the Maternal Newborn Community Health Project at Kijabe Hospital in Kenya. I work with a team of Kenyan nurses and clinical officers who reach into communities through training to impact maternal and newborn health. Our team trains Community Health Extension Workers who in turn train Community Health Volunteers. This platform is used not only to impact the health of Kenyans but also opens doors to share the Gospel throughout Kenya. We seek to improve the rates of maternal death rates (1/33) during childbirth and the neonatal death rate (200/day) in Kenya. I am involved in supporting the Kenyan staff to grow professionally as the future leaders in Community Health and research.